If you’re a small business just getting started online, there are 2 advertising strategies you should know about and they both relate to being first in Google’s search results, everything else is “fluff.” Sure, it doesn’t hurt to set-up 25 social media profiles and start twittering and facebooking your heart away, or advertise on select sites, but let’s not get ahead of ourselves. Right now, millions of people are searching for your products and/or services through Google. Can they find your business easily? Search Engine Optimization (SEO), Search Engine Marketing (SEM), “being found on the Internet,” “getting to #1 in the Google” whatever you’d like to call it, a business needs to be positioned prominently online so that it can be discovered easily by potential customers. One of the best and profitable ways for small businesses to advertise online is through pay-per-click (PPC) marketing. Your business will be prominently displayed in search results and you only pay when someone clicks on your ad and enters your website. PPC serves as a relatively easy, cost-effective and immediate way to get your advertisements in front of a huge pool of potential customers. Achieving a natural position in search results for high-traffic, profitable keywords is the ultimate web marketing achievement for any business. 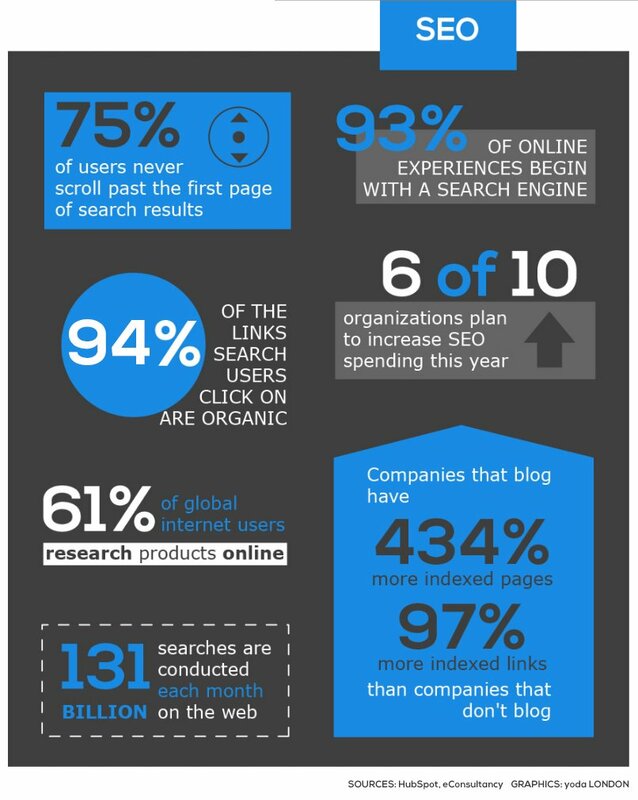 Organic results are the search results that come up naturally when someone conducts a search. Organic SEO is never guaranteed and is the collective result of website optimization, content marketing, blogging, back-linking and building up your website's natural popularity over time. Start with both! Doubling your marketing efforts doubles your results. Both approaches are very different and can be taken simultaneously. One does not affect the other directly, although you can gain insights and learn about your target market, competition and potential opportunities as you dive into each strategy. A common misconception is that because “paid” advertising is directly paid for, organic search results are somehow “free.” When it comes to meaningful results, even organic results have a cost (except that cost doesn’t go to Google, so from Google’s point of view, it’s unpaid). Thousands of businesses are competing for that top spot for profitable keywords. Maintaining first page search results in Google for hot keywords like “auto insurance,” “mortgage broker,” anything to do with “loans,” “attorney,” “credit,” “lawyer,” “hosting,” “trading,” or “software” costs businesses thousands of dollars a month and countless hours of generating fresh, insightful website content to maintain their top position. The vast majority of website traffic comes from search engines. It pays to be in the top spot. Fruitful organic search results require continuous effort, time and dedication, but the rewards and return on investment can be greater than pay-per-click ads given enough time, budget and work. Being on the first page of Google for target keywords is the ultimate marketing achievement for many tech-savvy businesses - not tech-savvy as in technology industry related; tech-savvy as in businesses that understand the power of the Internet when it comes to marketing. According to this definition of tech-savvy, insurance companies are extremely tech-savvy, while cleaning and manufacturing companies, on average not so much.. Is your business tech-savvy? Yes it is, because you’re reading this blog post! Side note: if you’re in an industry that’s lagging behind in terms of proper Internet participation (like nursing, senior care, schooling, cleaning, industrial equipment, local shops, restaurants, accounting, clubs, social work and similar fields) then the online market is yours. If you have a solid, dynamic website with good search engine visibility, you will dominate your competition and you are already way ahead of the game in your industry. Some businesses will continue to resist the pressures of keeping up technology, and that only works to your advantage. If you’re a small business with a relatively small website, you’re not going to be on the first page of Google for high-traffic keywords overnight, especially if you’re in a competitive industry (that’s why we recommend AdWords PPC marketing in conjunction). Be wary of any company that makes SEO promises and guarantees. Organic results are never guaranteed. Organic results can only be measured in terms of risks, chances and probabilities. Essentially, pursuing SEO is a highly calculated and strategic gamble. The whole idea of finding niches and targeting geographically ties in nicely with pay-per-click advertising. With pay-per-click advertising (Google AdWords) you can be really specific with the exact customers you’re looking for. Think about it –you’re paying for each click on your advertisement, the clicks better be relevant! So we’ve already established that the best approach for small businesses to compete in this sea of websites is to find a niche. Narrow down your target market to speak to your potential customers on their level. Going back to the accountant example, if you’re an accountant for small businesses in Toronto, then PPC advertising is the best way to target customers who are looking exactly for “small business accountants in Toronto.” If someone on google.ca searches for “accountant” – there is probably less than 0.01% chance that they are looking specifically for the small business accountant located in Toronto. Although Google’s getting better at delivering geo-located results, the users searching for those terms could easily be in Vancouver, Halifax, or anywhere else in the country. If you have a very localized business, not only are these types of searches wasted on your part, you’re also competing with all accountants across all of Canada for search engine ranking! Enter Google Adwords. With AdWords pay-per-click advertising, you can target users by exact location, time zone, and a hundred other parameters that you can adjust for to maximize the number of clicks on your ad that turn into conversions (sales). With AdWords, you pay Google a small fee for every visitor to your website who comes from its pay-per-click ads. So the goal is not only to maximize the number of clicks, but more importantly, to make sure the clicks you get are RELEVANT, and will result in a SALE. You will not get a sale if you’re an accountant based in Toronto, and the user searching for “accountants” happens to be in Vancouver. You will not get a sale if someone is looking for CA accountants and you’re a CMA. You will not get a sale if you target small to medium businesses and your visitor is looking for personal accounting. That click on your ad gets wasted. Examples of poor campaign set-up and wasted ad clicks are the biggest reason small businesses abandon AdWords battered, bruised, and beaten swearing it off forever and claiming it doesn’t work for them. Targeting relevant clicks is a carefully orchestrated art that requires stepping in the shoes of your potential customer and figuring out how they conduct searches in your industry. Thousands of small businesses in North America are generating most (yes more than half!) of their revenues from AdWords alone, from limo service companies to jewellery stores to consultants to web development companies. Almost any small business can achieve a good return on investment from AdWords if they offer a competitive value proposition, that is, they have a good product or service to sell at a good price. A properly set-up, optimized AdWords campaign that targets click relevancy, more than click volume. Quite a lot of businesses overlook point #3. There are some things that you just can’t sell easily. Just because we’re on the Internet doesn’t mean that you can open an online store that only sells striped sweaters, for $200 a piece. Or to put in subtler terms, if your competitors are offering the same product or service with more options, better quality, experience, reviews and/or better value for the money, then having the perfect website and perfect PPC ad campaign is not going help you much, but neither are any other forms of marketing. So let’s say you have point #3 covered. You’re offering a product or service that’s in high demand, you’re doing reasonably well with referrals and traditional marketing techniques, but things have gotten a bit stagnant lately and you would like to expand your horizons. You are the perfect candidate for PPC ad campaigns. Now, here’s where traditional businesses start to stumble a bit. All your successful competitors have an online presence. Business websites are the norm and make businesses look professional, progressive, and legit. You understand the importance and you feel the pressure to follow suite and get a website, finally. Unfortunately, small businesses often make the mistake of starting with something really cheap just to prove they’re online, enough to show “Hey, we’re here too! Look we have a website!.” This is a bad approach, as I always say, websites are often the first impressions that people have of your business. If people see an amateur website, they’ll think your business is amateur. Plain and simple. Think about how many times you’ve done it yourself. It is important to have a website that not only looks professional, but solves your customers problems simply and directly, with unique selling points in plain view, and a strong call-to-action. Having covered points 1) and 3), setting up a proper working AdWords campaign is a lot easier. The main goal in AdWords is to give customers exactly what they want, when they want it and how they want it. This includes the proper use of keywords, ad text and landing pages. A successful AdWords campaign cannot exist without a bit of R&D, experimentation and trial & error. Perhaps the most important and overlooked item in PPC campaigns are the proper use of landing pages. Revisiting our accountant example once again, what happens if potential customers search for sub-categories of accountant, such as “corporate tax accountant”? Should the users just land on the website homepage and fend for themselves? I mean, it’s obvious you’ll have a corporate taxes page somewhere on your website, they just need to find it and click on it.. Well you just lost half your customers, and tossed a lot of ad budget in the garbage. Most of them will call your competitor who is leading them by the hand from the Ad Text that directly matches their keywords to the landing page on their website that says in big, bold text at the top of the page “Corporate Tax Accountant” with their contact info in your face: Call us today! Your landing page is the most important piece of the web marketing puzzle. It is the destination page for all the valuable traffic you have invested in. Too many businesses focus too intently on the traffic generation part and omit the very web page to which they're driving traffic to! That specific web page, not website, web page. Again web PAGE. That destination web page is doing the real sales work. That web page has to contain the keyword that people are searching for, and that keyword has to be prominently displayed. If the user is searching for "small business accountants Toronto," then your landing page title needs to be Toronto's Small Business Accountant or Small Business Accountant in Toronto. Yes, if you have 10 different keywords, like Chartered Accountant, Tax Accountant, CMA Accountant etc., then you might need 10 different landing pages. Bear in mind, that doesn't mean it will cost 10x more to develop 10 new web pages. You invest properly into one solid, conversion-maximizing awesome landing page, and then clone it 9x just replacing the necessary content. Then you end up with 10 solid, conversion-maximizing awesome landing pages at the price of one. We've really singled out accountants for this entire post. This concept is equally applicable to every single industry, product or service that the general public has knowledge of. In sum, web marketing is not terribly complicated if you understand the basics and importance of SEO, PPC, and Landing Pages. The execution, however, can get a little exciting. There is no SEO tool or package or solution you can buy to guarantee first page results. Tools that consist of providing you with information or some kind of analysis are usually FREE. The way to achieve great web marketing results is through long-term, diligent content building for organic results, and campaign fine-tuning for PPC ads.